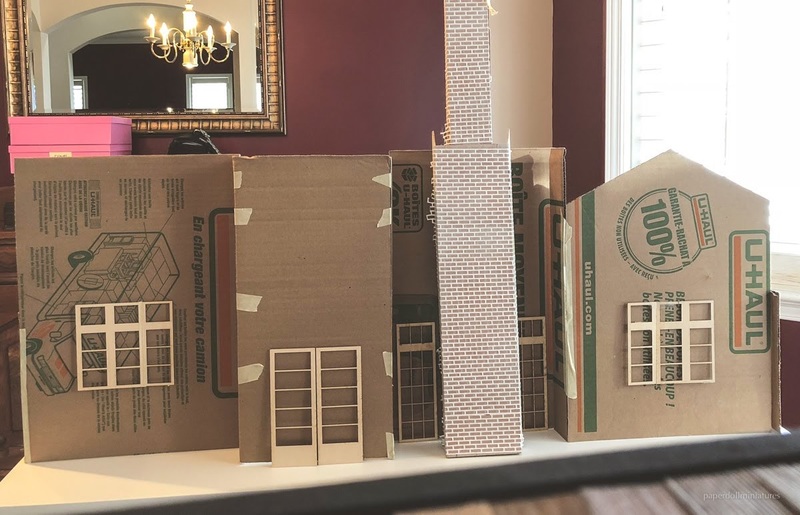 After years of dreaming about making a custom dollhouse from scratch, I'm jumping in and making it a reality. It took a month of researching and drawing out ideas to come up with my final design and I'm excited to share my plans with you today. 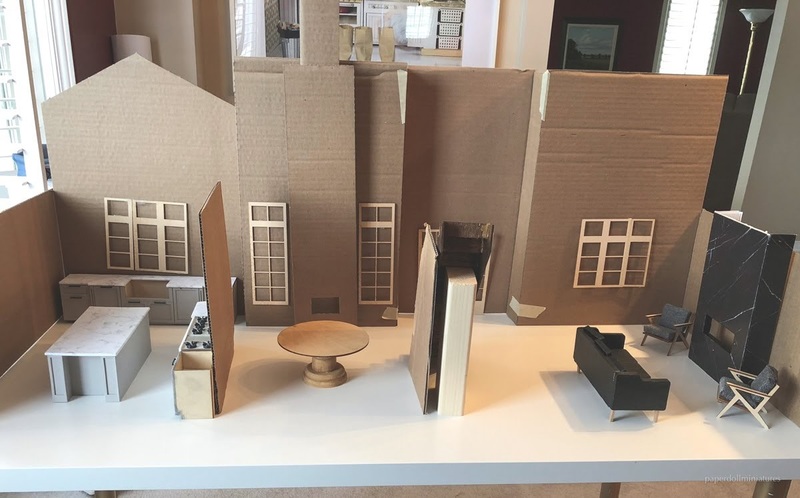 This dollhouse is inspired by some real life new construction homes in the southern United States. I just fell in love with the transitional design (modern meets traditional) and the big chimney on the front. 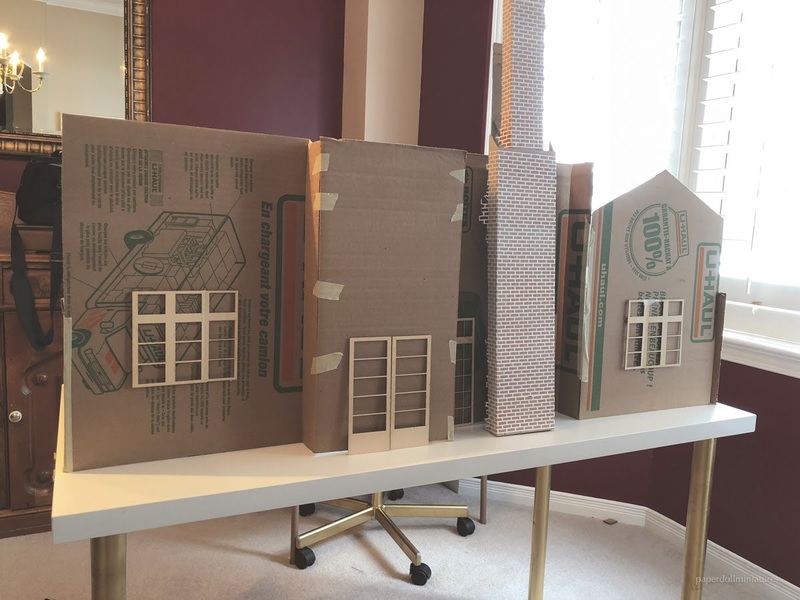 Originally my plans included another smaller sized addition on the left side with a gable, but it would have become too large of a dollhouse for me to practically manage. As is, the dollhouse will take up the entire Ikea desk width! Originally I debated about getting the Victoria's farmhouse but over time I realized the extent of my kit bashing would make buying the kit a waste. 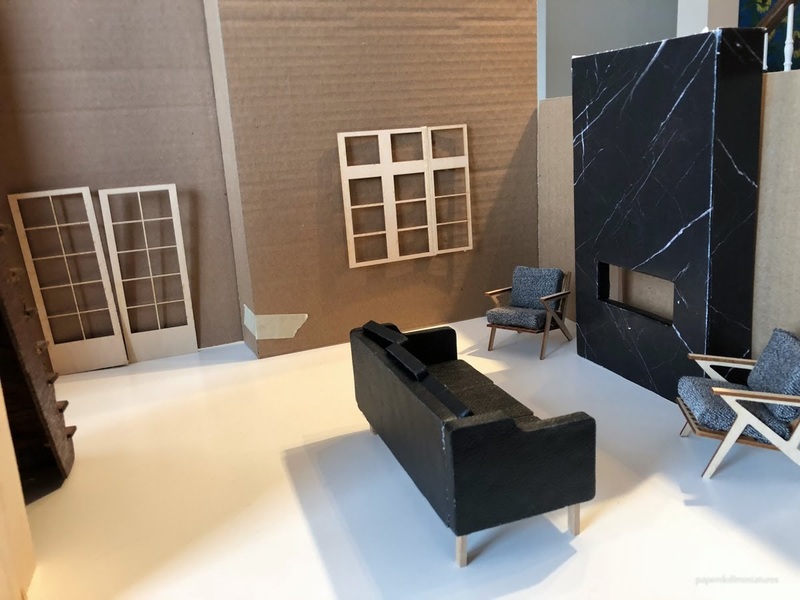 I've learned that what I most enjoy is styling and creating large luxurious spaces in miniature, so I've come to accept the fact that it just means I'll be building bigger houses. I'm a little nervous to do everything myself... but I'm really excited to get to play! I spent a lot of time trying to figure out the best layout for the lower floor. 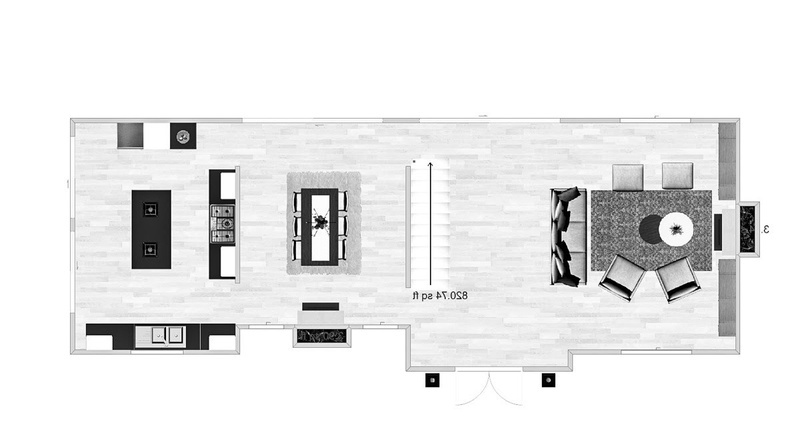 Below is the first runner-up option, with the kitchen to the right. In the end I thought it just felt too open on the living/dining side. However, the layout I like best is with the kitchen to the left (below). 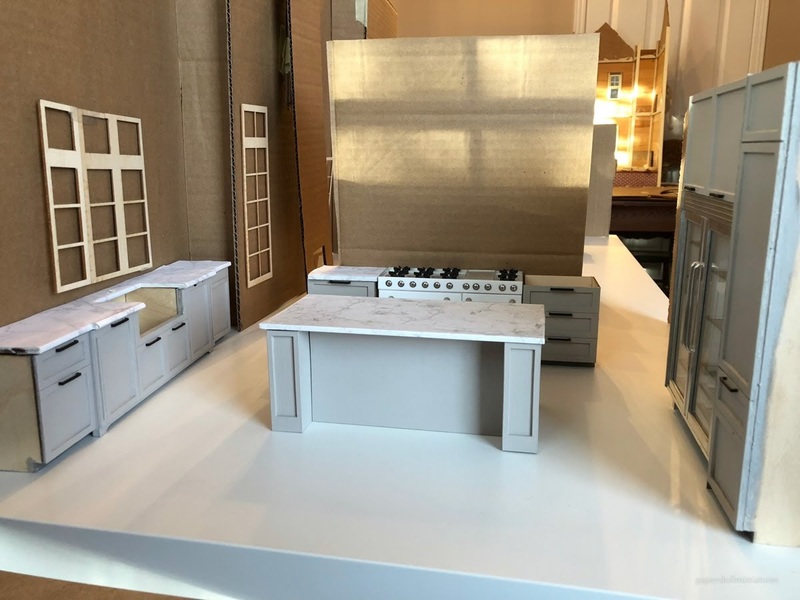 As much as it would make sense to combine the kitchen and dining on the left, I wouldn't have as easy visibility into the kitchen so I've separated them. Priority wise kitchens are my favourite miniature to make so I want it to have the best access and viewing possible. It will open on the side and not on the back. The plan is to have the kitchen on three of the walls with side access instead of rear. 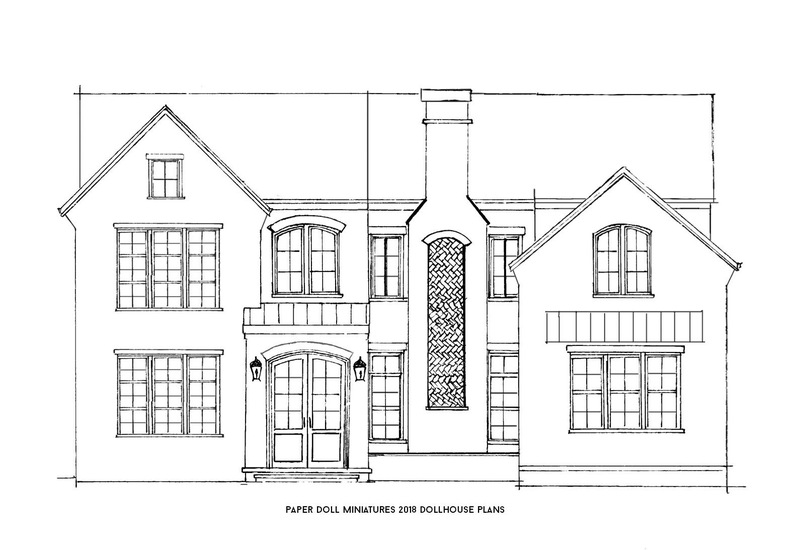 The exterior will be a mix of painted brick, white wood siding, and some stained maple trim accents. I think the second floor will be a breeze to layout since my only must haves are one bedroom and bathroom. I'd love your thoughts on the design so far and hope you'll join me along the way! You are embarking on a wonderful creative journey, one it seems that will bring an incredible amount of satisfaction. With all of that design space to play with, compromises will be gloriously few! I love the facade, and look forward to seeing your plans come alive. The layout flows very nicely from one space to the next, and all the preparations you're making are sure to pay off. Making this from scratch means you aren't limited and can really make the architecture work with the fittings and fixtures. Will the structure come apart in sections for ease of relocating, if necessary? I am sure you have already measured interior doors to be sure you can squeeze the structure through them - something I once failed to anticipate but luckily, narrowly got away with. What materials are you using in terms of wood for the structure etc.? This is going to be so much fun to watch, and I hope you find time for lots and lots of posts on the progress! Hi Jodi, thanks so much for your thoughts. I'm tempted to make the kitchen part de-attach but at the same time... it might just be easier to keep the house all as one. The main thing I've done to keep the size down is keeping the depth around 21 inches. Yep, I've done the opps won't fit through the door too! The plan is to laser cut MDF but I'm not sure if I want to do 1/8 or 1/4 inch. I'm worried 1/8 will be too narrow for windows but it would it would weigh less which would be great. I think I'm really just going to have to give a lot more thought to accessibility. I want to be able to access the house from the front when it's displayed. Hmmm. At least the initial plans are done, I've been so overwhelmed trying to plan it out I almost quit and did a pre-made kit. I just want to get to making and blogging about it. And since there is no deadline I'm going to be able to balance the blogging this time around. Thanks again, always love hearing your ideas! Un buen comienzo para un gran proyecto!! do I get this right; you can open the kitchen sidewall and the back wall as well? that won't work because of the weight of the ceiling. I reinforced with beams and this helped. so, you will have to figure out something. maybe even quadrant metal rods are beams? Hi Marion! My boyfriend always expresses the same concern... you want it to be a magic dollhouse that has no supporting walls?! haha. To clarify the kitchen will only open on the side, and maybe a tiny opening a couple inches in the back if there is room on the other side of the fridge. It's the rooms like the living room I'd like to open a bit in the front as well as the back. I think the way to do this is to do small openings. I've seen some dollhouse kits window bays open at the front. We'll see! Honestly just getting the design layout is a relief so now I can play with all that stuff. Thanks for your thoughts! The beams are really a great idea. Personally, I would go for 1/4" mdf (if you don't want to use Ply which is lighter). I think when you build something so big, you have to accept weight will be an issue and you need to make it structurally sound. Only advice I would give after a 'doh' moment with my own builds is to make sure the first floor room height accommodates the staircase. Hi Pepper, I really appreciate the mdf advice. I've liked mdf because it's easy to paint, but now I think I will go to the hardware store and take a look at the plywood too. And I do think you're right, 1/4" is probably the best. I'm going to go back and look through your manor posts, but I do remember the stairs incident! I do hope you bring that build back on the blog eventually :) I have an old staircase from another dollhouse project I've been using in my mockup to get the height so hopefully I avoid that mistake! Hi Kristine! I LOVE the front facade of your design! It reminds me of some of the "Mock Tudor" houses of the twenties (my Grandparents had one) that were semi-open plan inside and had lovely old large windows and doors... steel framed windows too! I agree with Pepper's mention of the weight of plywood... and would additionally caution you to go the extra expense for "good on both sides" furniture grade plywood... not the stuff they use for sub-floors which warps and the pine "bleeds" into painted surfaces.... guess how I know? LOL! I think you are brave to start from scratch... but that is the most fun in my way of thinking! My "Lovely Old Dollhouse" was built from scratch by my Grandpa... plywood that is still sturdy! And my "Castle" is built from plywood... on my own design... it is in three sections that fit together because it is so large...... and I'm still working on it! LOL! I can't wait to see your house getting under way! Thank you Betsy for all your advice! I'm going to have to go check out the materials at the store again. Whenever I think of plywood I think of the knotted kind that shows through paint, so I think your right and the furniture grade plywood will be best. Ugh... I can just imagine how expensive this is going to get though! A great start! I love the modern furniture in an old style house. It's fantastic how you make it from scratch. Thanks for sharing the way you are working on this project. Thank you Drora, it's exciting to get it underway! This looks amazing so far. And I love that kitchen design. I think varying the openings to the house will give you a lot of the flexibility you'll need. Planning out electricity is the hardest for me so I hope that goes smoothly for you. Thanks Sheila, right now it's a struggle to just get the wall measurements right at the front. There are a lot of tricky angles to be worked out. I'm going to keep making cardboard mock-ups until I get it right so I don't waste all my good wood. I was thinking of using the fireplaces to hide the electricity? I think that's the best way to go. I like round wiring and will probably do a faux ceiling to hide the wires. Pot lights and hanging lights. OH right. That reminds me I have to account for that extra bit of height too, don't I? ...I'm so worried I'm going to cut the whole house out and realize my math is wrong and I need to cut it again. I like how you think (big), and your confidence and willingness to engage in new challenges! As a “learn by doing” person, I’ve amended that to include “and watching others“. Looking forward! El diseño es precioso. Vas a trabajar mucho pero es un estupendo proyecto. I can't wait to follow along! I'm working on my first kit, but I want to build my own design someday like you are, so I hope I'll learn some things. This will be such a fun project. Thank you Caroline. 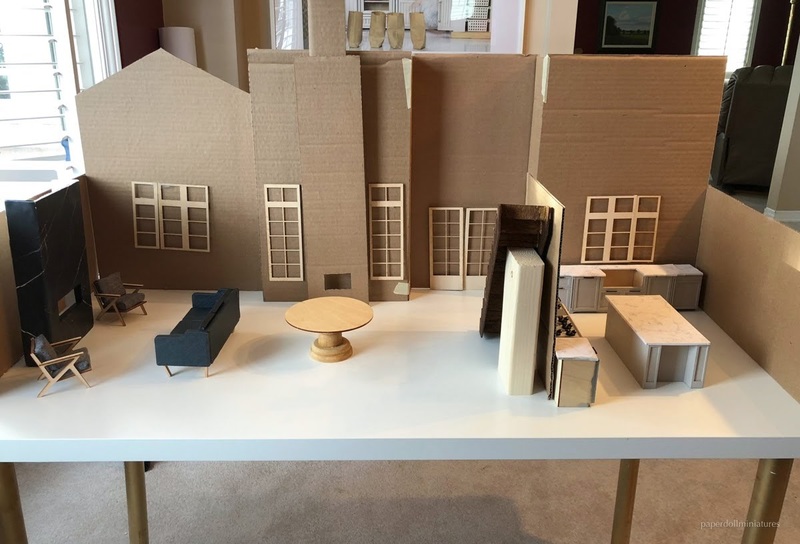 It's so exciting to see your project coming along, I look forward to following! As for me, I think the beginning stage is the toughest but I know it will be worth it. I can't wait to move on to the finishings and decor! It certainly looks very nice and I cannot wait to follow your Work. Thank you Farmor! I appreciate your support! Thank you Brae! I was kind of aiming to finish this house in a year... haha we'll see! The chimney on the front is what sold me on the design! I saw two real life homes being built like this and knew it was the perfect way to balance out that first gable. I decided to work the interior layout to accommodate it no matter what. I love your blog and your design. 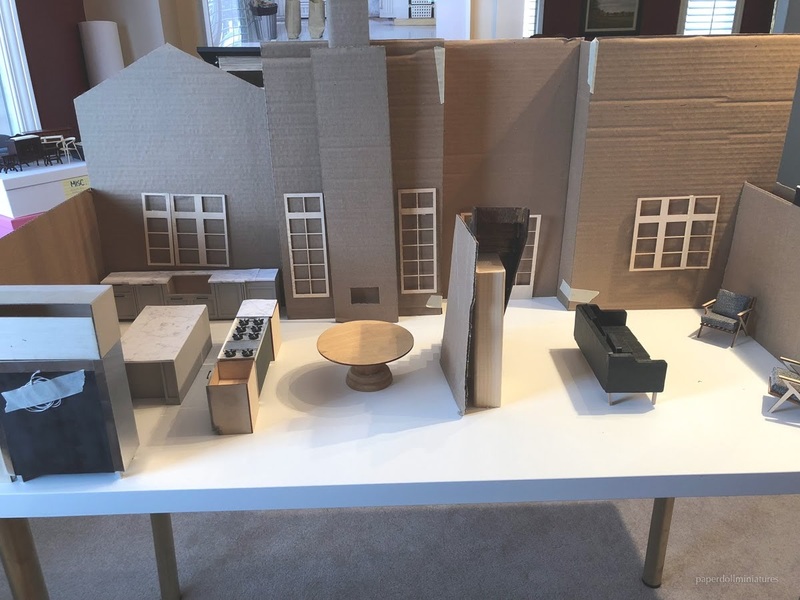 I am working on my custom dollhouse using the Dorie Kurtz method. I am looking forward to following your success.